This is generally a corrective move in the direction opposite of the prevailing trend that is surrounded on both ends with a big 1-2 and big 4-5. Meanwhile – that inside 3 is comprised of a CLEAR 5-wave 3 pattern and the entire pattern itself can generally be guided by two parallel lines. Wave 1 is largely retraced back by wave 2 — and then wave 3 forms a CLEAR 5 wave pattern. 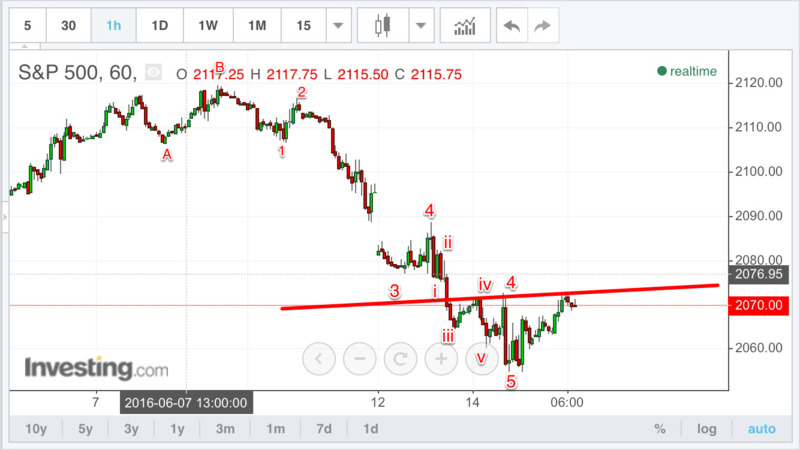 Followed by a strong wave 4 retrace — and then a wave 5 down that engulfs the entire wave 4 and goes to new lows — such that this new bottom lines up by connecting the bottom of 1 and 3. …then, that we likely experienced a 5-wave channel that concluded with a wave 4 pop and wave 5 drop – followed by A-B reversal. After a big wave 1 rally – this wave 2 pullback went straight down without much of a bounce along the way. Here’s how it looked turn by turn. 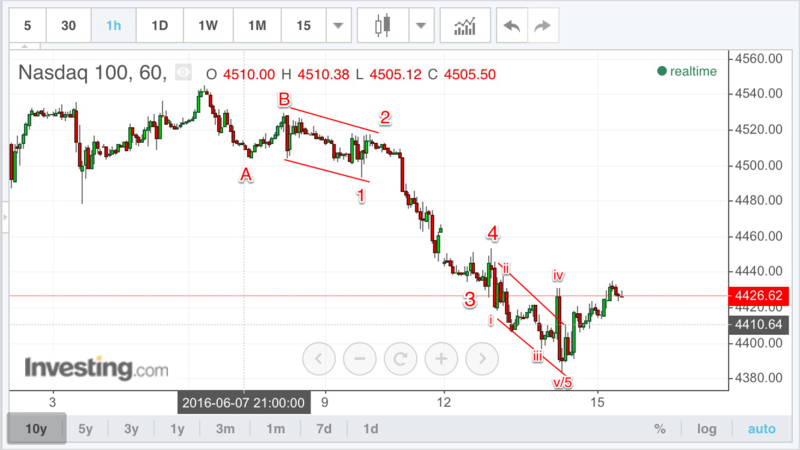 Notice the two parallel lines – showing a 5-wave channel in 1st and 5th wave position. While the above chart appears to have bottomed, in actuality, it dropped one more time as overnight it formed another clear 5-wave pattern down. Even after the 5thw ave down, and the massive A-wave rally right back to 4th wave resistance — the B-wave brought the Nasdaq all the way back to the lows and stayed there for most of the day. But the parallel channels – were surrounded by big engulfing candles on either side of that 5-wave pattern. This is the same chart – but for the S&P. Notice the i-ii-iii-iv-v 5-wave channel that was followed by a wave 4 pop and a wave 5 b earish engulfing pattern that marked the bottom of that 5th of 3rd. What follows next would be a 4th wave retest – at 2075. There was a Fed announcement with a pop towards 2079 — and then from there it dropped to new lows at 2041 — before bouncing back to 2075. One thing to note is that it’s quite common to see the 5-wave channel in the 3rd wave position. 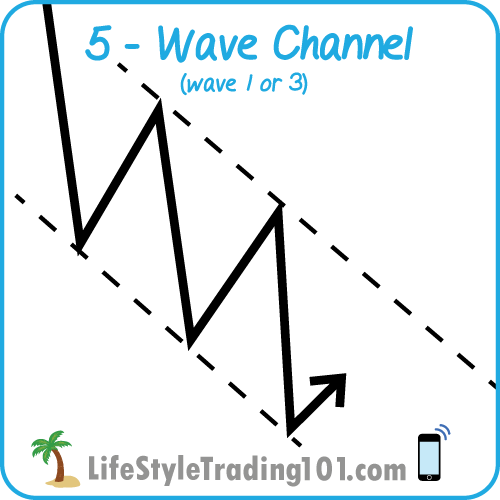 The Russell also simultaneously showed a 5-wave channel labeled in i-ii-iii-iv-v.
Here’s what actually happened — the 3rd wave morphed into a 5-wave channel. 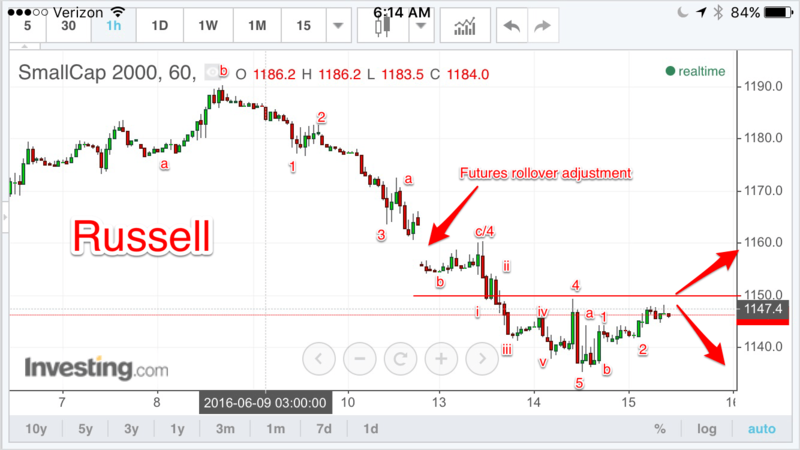 The Russell fell in a C-wave after that 5 wave completed.